The patented XP Technology creates an instrument edge that requires no sharpening during its lifetime. According to American Eagle Instruments, the technology behind XP instruments is what differentiates them from other manufacturers’ instruments. XP Technology is a patented surface engineering process in which the metallurgical composition of the instrument’s surface is enhanced, giving it the properties of a more durable and significantly harder material. This process creates an edge that eliminates the time-consuming and imperfect process of re-sharpening instruments. I find that American eagle instruments are the best. I especially like the McCalls currette. The angle of the currette tip gives easy access interproximally. It keeps it sharpness. Since I started using XP American Eagle Instruments I have cut the number of instruments on my tray to 1/3 what it use to be. I cannot tell you how much faster my procedures go by always having a sharp instrument. The lighter stroke "exploratory" is more comfortable for my patients and causes less fatigue for me. After purchase I send 12 of my old instruments (another brand) and get 3 free it is great! American Eagle Rocks! Both my hygienist as well as myself have used the XP scalers much to our satisfaction. Not only does the slimline design lend to enhanced accessibility but also maximal operator tactile sensitivity. The user may have an easier time negotiating the slight nuances of anatomical tooth anatomy with the certainty and confidence of leaving no residual calculus,cement,etc. behind. As an additional benefit, the new technology will also increase chairtime hygiene as wrist-fatiguing and time-consuming instrument sharpening is now a thing of the past. My hygienists were skeptical about less sharpening, but it's true. I have heard less sharpening going on after using these. 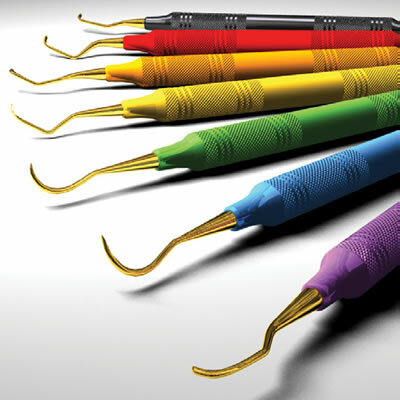 The colors are fun and make it easy to see what scaler they're using. The tips seem to stay sharp longer thus reducing my overhead on replacing dead scalers every 3-6 months like some other pricey brands. Patients like them because they look friendlier than traditional stainless steel.